Pictured above is the colony as it now appears; the above photo was taken June 30, 1998. Below is the colony just after I purchased it in February. 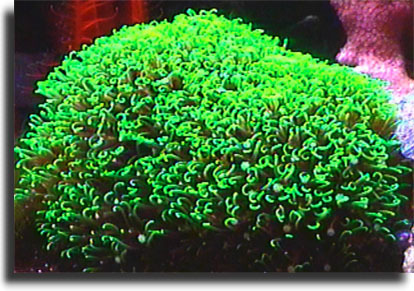 As you can see the polyps are significantly greener and more full. About the only thing holding back the growth is the shape of the rock they are on. The colony is basically on a little island being supported by a branch that I placed into a hole in another rock, thus there is not really room for any more expansion. 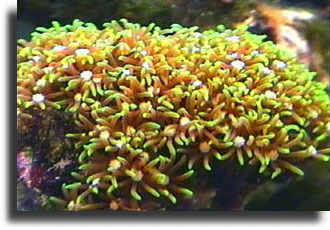 The origin of these polyps is Jakarta, Indonesia. They grow fairly rapidly and I have recently started to propogate them. I removed a small connected branch from the main colony, which covered over with polyps in a few months, and from that I have removed several smaller pieces to experiment with. The purple fleshy part can be cut readily from the colony with a razor blade, slicing down to the rock, and then lifted away easily. I made sure to get at least a few polyps in each cutting. Both were dried slightly against a paper towel and then glued with crazy glue gel to a clean dried piece of coral and placed back into the tank. To my surprise, both cuttings had open polyps the following day, and didn't seem to mind the glue at all. I'll add some pictures of the growth as soon as I take them.